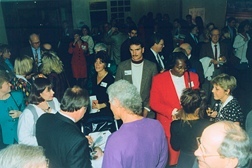 Capitol Gallery, Tallahassee, Florida More than 600 invited guests celebrated the Opening Reception atop the Capitol. 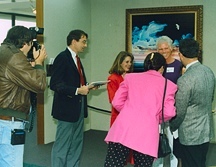 Approximately 100,000 viewed the Exhibition during the 1993 Legislative Session. "THE GULF TO THE CARIBBEAN"
The Florida Department of State, Division of Cultural Affairs. Pre-reception newspaper and TV interviews. began in 1988 to protect and restore the Gulf environment." Hal and B.J. toast their collectors at a party celebrating 20 years of his art. "Egmont Key 1990" Canvas in background, specially commissioned by Barnett Bank. "THE BAHAMIAN GAP - EXOTIC MOODS & ADVENTURES"
" I want to put the natural environment on stage and give it a dramatic focus. We feel it is time to reach out and join together to care for our global environment." "THE SETTING: A CHANGEFUL SCENE"